Military personnel are members of the state's armed forces. Their roles, pay, and obligations differ according to their military branch (army, navy, marines, air force, and sometimes coast guard), rank (officer, non-commissioned officer, or enlisted recruit), and their military task when deployed on operations and on exercise. Those who serve in a typical large land force are soldiers, making up an army. Those who serve in seagoing forces are seamen or sailors, and their branch is a navy or coast guard. Marines serve in a marine corps. In the 20th century, the development of powered flight aircraft prompted the development of air forces, serviced by airmen and women. Designated leaders of military personnel are officers. These include commissioned officers, warrant officers and non-commissioned officers (NCOs). For naval forces, non-commissioned officers are referred to as petty officers. Organizations other than state armed forces include military personnel, such as paramilitary organizations and non-state armed groups. Most personnel at the start of their military career are young adults. For example, in 2013 the average age of a United States Army soldier beginning initial training was 20.7 years. Historically, the use of children under the age of 18 for military purposes has been widespread - see Children in the military - but has been in decline in the 21st century. According to Child Soldiers International, as of 2017 approximately two-thirds of states worldwide had committed to restrict military recruitment to adults, while 50 states were still recruiting personnel aged 16 or 17, including most of the world's major military powers. Most personnel are male. The proportion of female personnel varies internationally; for example, it is approximately 3% in India, 10% in the UK, 13% in Sweden, 16% in the US, and 27% in South Africa. Many state armed forces that recruit women bar them from ground close combat roles (roles that would require them to kill at close quarters). Compared with male personnel and female civilians, female personnel face substantially higher risks of sexual harassment and sexual violence, according to British, Canadian, and US research. Personnel who join as officers tend to be upwardly-mobile young adults from age 18. Most enlisted personnel have a childhood background of relative socio-economic deprivation. For example, after the US suspended conscription in 1973, 'the military disproportionately attracted African American men, men from lower-status socioeconomic backgrounds, men who had been in nonacademic high school programs, and men whose high school grades tended to be low'. As an indication of the socio-economic background of British Army personnel, in 2015 three-quarters of its youngest recruits had the literacy skills normally expected of an 11-year-old or younger, and 7% had a reading age of 5–7. Military personnel may be conscripted (recruited by compulsion under the law) or recruited by attracting civilians to join the armed forces. Recruitment stalls (e.g. air shows, military amusement parks such as Patriot Park in Russia, national days and armed forces days). "Our new model is about raising awareness, and that takes a ten-year span. It starts with a seven-year-old boy seeing a parachutist at an air show and thinking, 'That looks great.' From then the army is trying to build interest by drip, drip, drip." Once they are old enough to apply, candidates for military employment typically apply online or at a recruitment centre. Many eligibility criteria normally apply, which may be related to age, nationality, height and weight (body mass index), medical history, psychiatric history, illicit drug use, criminal record, literacy and numeracy, proof of identity, satisfactory references, and whether any tattoos are visible. A minimum standard of academic attainment may be required for entry, for certain technical roles, or for entry to train for a leadership position as a commissioned officer. Candidates who meet the criteria will normally also undergo a medical examination, a battery of questions to test aptitude, and tests of physical strength and stamina. Most state armed forces that enlist minors (persons under the age of 18) are required by law to obtain the informed consent of one or both parents or legal guardians before their child's enlistment can take place. In practice, consent is indicated on a form, which parents/guardians sign. Once enlistment has taken place, recruits are subject to military terms of service and begin their initial training. Some, who actively oppose military recruitment practices in the belief that they are misleading, harmful or immoral, engage in counter-recruitment activity. Military personnel must be prepared to perform tasks that in civilian life would be highly unusual or absent. In particular, they must be capable of injuring and killing other people, and of facing mortal danger without fleeing. This is achieved in initial training, a physically and psychologically intensive process which resocializes recruits for the unique nature of military demands. In conditions of continuous physical and psychological stress, the trainee group normally forms a bond of mutual loyalty, commonly experienced as an emotional commitment. It has been called a "we-feeling", and helps to commit recruits to their military organisation. Creates the basis for action in the battlefield. In order to ensure that recruits will kill if ordered to do so, they are taught to objectify (dehumanize) their opponent as an ‘enemy target’ to ‘be engaged’, which will ‘fall when hit’. They are also taught the basic skills of their profession, such as military tactics, first aid, managing their affairs in the field, and the use of weaponry and other equipment. Training is designed to test and improve the physical fitness of recruits, although the heavy strain on the body also leads to a rate of injury. Recruits enter a binding contract of service, which may differ according to rank, military branch, and whether the employment is full-time or part-time. Full-time military employment normally requires a minimum period of service of several years; between two and six years is typical of armed forces in Australia, the UK and the US, for example, depending on role, branch, and rank. The exception to this rule is a short discharge window, which opens after the first few weeks of training and closes a few months later, and allows recruits to leave the armed force as of right. Part-time military employment, known as reserve service, allows a recruit to maintain a civilian job while training under military discipline for a minimum number of days per year in return for a financial bounty. Reserve recruits may be called out to deploy on operations to supplement the full-time personnel complement. After leaving the armed forces, for a fixed period (between four and six years is normal in the UK and US, for example), former recruits may remain liable for compulsory return to full-time military employment in order to train or deploy on operations. Military law introduces offenses not recognized by civilian courts, such as absence without leave (AWOL), desertion, political acts, malingering, behaving disrespectfully, and disobedience (see, for example, Offences against military law in the United Kingdom). Penalties range from a summary reprimand to imprisonment for several years following a court martial. Certain fundamental rights are also restricted or suspended, including the freedom of association (e.g. union organizing) and freedom of speech (speaking to the media). Military personnel in some countries have a right of conscientious objection if they believe an order is immoral or unlawful, or cannot in good conscience carry it out. Personnel may be posted to bases in their home country or overseas, according to operational need, and may be deployed from those bases on exercises or operations anywhere in the world. The length of postings and deployments are regulated. In the UK, for example, a soldier is expected to be on deployment for no more than six months in every 30 months. These regulations may be waived at times of high operational tempo, however. Perks of military service typically include adventurous training, subsidised accommodation, meals and travel, and a pension. Some armed forces also subsidise recruits' education before, during and/or after military service; examples are the St Jean military college in Canada, the Welbeck Defence Sixth Form College in the UK, and the GI Bill arrangements in the U.S. Conditions for participation normally apply, including a minimum period of formal military employment. While on duty, military personnel are normally required to wear a military uniform, normally showing their name, rank and military branch. ^ US Army (2013). "Support Army Recruiting". www.usarec.army.mil. Retrieved 2017-12-11. ^ a b "Where are child soldiers?". Child Soldiers International. Retrieved 2017-12-08. ^ Fisher, Max (2013-01-25). "Map: Which countries allow women in front-line combat roles?". Washington Post. ISSN 0190-8286. Retrieved 2017-12-12. ^ UK, Ministry of Defence (2015). "British Army: Sexual Harassment Report" (PDF). Retrieved 2017-12-11. ^ Canada, Statcan [official statistics agency] (2016). "Sexual Misconduct in the Canadian Armed Forces, 2016". www.statcan.gc.ca. Retrieved 2017-12-11. ^ a b Gee, David; Taylor, Rachel (2016-11-01). "Is it Counterproductive to Enlist Minors into the Army?". The RUSI Journal. 161 (6): 36–48. doi:10.1080/03071847.2016.1265837. ISSN 0307-1847. ^ Germany, Bundestag Commission for Children's Concerns (2016). Opinion of the Commission for Children's Concerns on the relationship between the military and young people in Germany. ^ Hagopian, Amy; Barker, Kathy (2011). "Should We End Military Recruiting in High Schools as a Matter of Child Protection and Public Health?". American Journal of Public Health. 101 (1): 19–23. doi:10.2105/AJPH.2009.183418. ISSN 0090-0036. PMC 3000735. PMID 21088269. ^ US Army. "Recruiter Handbook" (PDF). Retrieved 2017-12-10. ^ US Government (2001). "No Child Left Behind Act (2001) (Section 9528)". Retrieved 2017-12-10. ^ Committee on the Rights of the Child (2014). "Concluding observations on the report submitted by the Russian Federation under article 8, paragraph 1, of the Optional Protocol to the Convention on the Rights of the Child on the involvement of children in armed conflict". tbinternet.ohchr.org. Retrieved 2017-12-10. ^ UK, Army Cadet Force. "Join the Army Cadets". armycadets.com. Retrieved 2017-12-10. ^ "Armée de Terre (@armeedeterre) | Twitter". twitter.com. Retrieved 2017-12-10. ^ US Air Force. 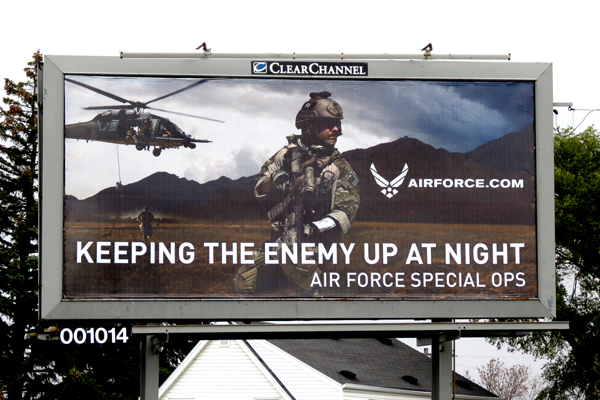 "US Air Force billboard [image]". Retrieved 2017-12-10. ^ British Army. "Meet the army: A guide for parents, partners and friends" (PDF). Retrieved 2017-12-10. ^ "Amazon.co.uk: HM Armed Forces: Toys & Games". www.amazon.co.uk. Retrieved 2017-12-10. ^ US Army. "Go Army". goarmy.com. Retrieved 2017-12-10. ^ Armstrong, S. "Britain's child army". www.newstatesman.com. Retrieved 2017-12-10. ^ "Optional Protocol to the Convention on the Rights of the Child on the involvement of children in armed conflict". www.ohchr.org. Retrieved 2017-12-10. ^ a b McGurk; et al. (2006). 'Joining the ranks: The role of indoctrination in transforming civilians to service members', (in 'Military life: The psychology of serving in peace and combat [vol. 2]'). Westport: Praeger Security International. pp. 13–31. ISBN 978-0275983024. ^ a b c d Dave., Grossman (2009). On killing : the psychological cost of learning to kill in war and society (Rev. ed.). New York: Little, Brown and Co. ISBN 9780316040938. OCLC 427757599. ^ a b c d e John., Hockey (1986). Squaddies : portrait of a subculture. Exeter, Devon: University of Exeter. ISBN 9780859892483. OCLC 25283124. ^ Dornbusch, Sanford M. (1955-05-01). "The Military Academy as an Assimilating Institution". Social Forces. 33 (4): 316–321. doi:10.2307/2573000. ISSN 0037-7732. JSTOR 2573000. ^ Gee, D (2017-07-03). "The First Ambush? Effects of army training and employment" (PDF). Veterans For Peace UK. Retrieved 2017-12-12. ^ Blacker, Sam D.; Wilkinson, David M.; Bilzon, James L. J.; Rayson, Mark P. (March 2008). "Risk factors for training injuries among British Army recruits". Military Medicine. 173 (3): 278–286. doi:10.7205/milmed.173.3.278. ISSN 0026-4075. PMID 18419031. ^ Milgrom, C.; Finestone, A.; Shlamkovitch, N.; Rand, N.; Lev, B.; Simkin, A.; Wiener, M. (January 1994). "Youth is a risk factor for stress fracture. A study of 783 infantry recruits". The Journal of Bone and Joint Surgery. British Volume. 76 (1): 20–22. ISSN 0301-620X. PMID 8300674. ^ Heir, T.; Glomsaker, P. (June 1996). "Epidemiology of musculoskeletal injuries among Norwegian conscripts undergoing basic military training". Scandinavian Journal of Medicine & Science in Sports. 6 (3): 186–191. doi:10.1111/j.1600-0838.1996.tb00088.x. ISSN 0905-7188. PMID 8827849. ^ Gordon, N. F.; Hugo, E. P.; Cilliers, J. F. (1986-04-12). "The South African Defence Force physical training programme. Part III. Exertion-related injuries sustained at an SADF basic training centre". South African Medical Journal = Suid-Afrikaanse Tydskrif Vir Geneeskunde. 69 (8): 491–494. ISSN 0256-9574. PMID 3961645. ^ "Army - Artillery - Air Defender". army.defencejobs.gov.au. Retrieved 2017-12-09. ^ Brigadier Nick Cavanagh (2014). "Witness statement of Brigadier Nick Cavanagh". Retrieved 2017-12-09. This page was last edited on 9 March 2019, at 14:27 (UTC).